Perhaps I didn’t say things very well yesterday in The Israel Folau furore continues – there have been some positive outcomes as various people have spoken up against Folau’s archaic and insulting (but still very common) religious beliefs. But very few if any people would have been hurt or offended if his small comment on Instagram had been like millions of other online comments every day and had been ignored. The social media and furore gave the comments publicity they didn’t deserve, and that exposed people to offence and hurt that otherwise wouldn’t have been suffered. Protesting and publicising the comments exposed millions to possible hurt and offence. While it is a feature of modern media and social media, why did Folau’s comment get so much attention and opprobrium? Folau is a rugby player. Until now his public utterances were not seen as important. Outspoken Destiny Church self-proclaimed pastor Brian Tamaki has come out in support of Israel Folau, hitting out at “cry baby gays” and agreeing the LGBTQ community could go to hell. He then used a hashtag he made up, “#crybabygays”, to sign off the message. Tamaki speaks to and tries to influence many people, but apart from a few passing mentions gets nothing like the criticism that Folau got. However Tamaki is largely ignored as an attention seeking nutter, while the normally private Folau is plastered and blasted. It is easy enough to say Israel Folau was wrong to get all religiously high and mighty on social media about homosexual behaviour. The question also naturally arises of how the mainstream media ought to be dealing with fundamentalist beliefs of any stripe in the first place – not to mention the perils of holding up people who happen to be good at kicking a ball, as also being liberal champions. It has been said before – by this writer, in fact – that not only sports stars but poets, critics, movie-makers, playwrights and rock performers tend to make for notably unreliable authorities on pretty much all matters outside of their chosen field (if on that). With only a few notable exceptions, they offer bad ideas on social policy, banal observations about economics and, yes, whoppingly ill-considered religious views, too. Some mainstream commentators have used the controversy to anguish over the limits of free speech. In the news business, these are sometimes known as whyohwhyofwhyohwhy pieces – commentaries that rather skirt a fundamental issue, in this instance the question of fundamentalism itself. Folau was, after all, simply giving his own, particularly rigid, Christian stance on homosexual behaviour. He also was expressing a view shared by many who take a severe interpretation of any of the three great monotheistic religions. Threatening hell for all sorts of behaviours has been common for yonks, as anyone who went to a religion orientated school (or church) in the past can probably attest. Christianity’s record in this regard is well known, notwithstanding the fact that plenty of thoughtful, devout believers, would argue the toss, or at any rate, question the focus on what consenting adults choose to do among themselves. But the ultra-Orthodox stream of Judaism isn’t exactly known for sanctioning homosexuality (although Israel – the country, not the player – generally takes justifiable pride in being the most LGBTQ-friendly country in the Middle East). And the ferociously anti-gay record in parts of the Muslim world, where homosexual acts are sometimes punishable by death, ought to make a western liberal blanch. As the British diver Tom Daley recently pointed out after winning the synchronised 10m Platform competition at the Gold Coast tournament, no fewer than 37 Commonwealth nations currently have anti-LGBTQ statutes: a rainbow mosaic of bigotry. But all hell breaks loose when someone known for sporting rather than speaking prowess has a comment dug out of the depths of the Internet and plastered all over the world. The media can even lead the way. A more constructive approach (other than sporting associations to insist their stars learn a few social manners) might be to pause a while longer before dining out on any such comments made by celebrities in the first place, and try to keep an eye on the wider picture. Sometimes fixating on just the one chance Instagram comment isn’t just unhelpful. It can even be a bit (sorry) sinful. Expecting the media to lead the way on sensibly dealing with things like this is probably as futile as hoping to go to heaven when you die. After recently raising something like $70,000 to pay for legal bills Cameron Slater at Whale Oil is testing the legal fundraising waters again in What would you do if the Leader of the Opposition called you a sociopath on television? Perhaps Andrew Little should shut his gob….after all there was quite a considerable effort on my part to help several of his MPs across the line…and it was ok then for them to have an “unhealthy relationship” with me. But what should I do readers? Should I sue his arse off him like Michael Laws suggests? Should TVNZ be a party to the action? Slater has been highly critical of others (Colin Craig) for taking defamation action. Any lawyers want in? It would seem an easy case, and after he caved to Judith Collins I should think he might not want the distraction keeping him busy defending himself and cost him lots of money and on the way through give me a lot more publicity. Is this something readers want to invest in via crowd funding the case with a share of any winnings is something? Seeking partners and raising funds for political attack legal action is ‘innovative’ but a very risky investment. I’d have thought Slater would have had enough legal hassles by now without actively seeking them. Perhaps he is looking at Brian Tamaki’s fundraising enviously. There’s a similarity between Destiny Church and Whale Oil, both are manipulating a devoted audience to raise money for their own benefit. Last night Campbell Live showed Tamaki in action in Hannah Tamaki fronts on church’s stage donation. 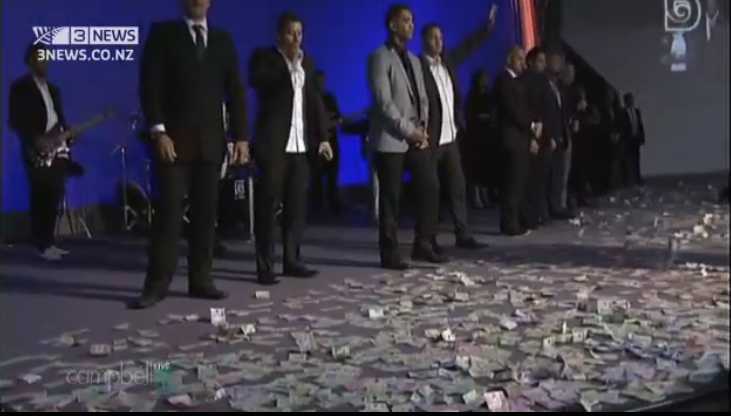 Last Sunday, the congregation of Destiny Church showered thousands of dollars at the feet of ‘Bishop’ Brian Tamaki in the hope of “qualifying for an unprecedented favour”. You will qualify for unprecedented favour, ’cause in due season shall reap. Come, along here, and place it, and put it all up on, not the stairs up on here, on the flat. Come come, place it, try and spread it out and put put the money there. Come come come come come. Take it out of the envelopes and spread it, spread it out. God’s told me how this should happen. It’s going to be placed in the open, so it can, so it can swirl the aroma and the fragrance can spread through the place, and the atmosphere, and it can sit here, and it can begin to allow that to arise to God. This is a clear message to every demon of poverty, every demon of poorness, economic inequality. My God shall supply all your need according to his riches and glory, according to Christ Jesus. My God, God that has blessed us, the God that has called Hallelujah. The Holy Spirit told me to do this, last night. Maybe there’s misinterpretation. Brian Tamaki asked for a carpet of money, so the aroma could swirl up to God. Religion has long been used to raise money for bishops living in opulence and for extravagant temples. Brian Tamaki seems as similar to Jesus as hell is to heaven. Whale Oil is nowhere near this. Yet. They are not a charity like Destiny. They are up front about what they want the money for and why. Slater does not seem to be living in luxury like the Tamakis. And to different extents have taken to fleecing. Slater has had a taste of evangelical style fundraising, and has been tempted to ask for more money to be thrown at his feet. Time will tell how far he takes it.